Seeking a Friend for the End of the World Blu-ray Review. Writer and Director Lorene Scafaria should be commended in creating a rather thought-provoking movie that will have you laugh and cry about a rather serious topic. Written and directed by Lorene Scafaria, this quirky romantic comedy is about finding love before the end of the world. Scafaria quickly sets up the premise from the first scene in the movie where the viewer is informed that the space shuttle has failed to stop a 70-mile wide asteroid from hitting the Earth and as a result, mankind has 3-weeks left. Upon hearing the news, Dodge's (Steve Carell) wife Linda (Nancy Carell) leaves her husband without saying a word and is never seen again. As society crumbles around Dodge, he attempts to get back into his "normal" routine and even attends work which is run a be skeleton crew. Ironically even his Mexican house cleaner Elsa is also turning a blind eye to the asteroid and continues to humorously to turn up to his apartment to clean. Unfortunately for Dodge, his world is about to get shaken up again and upon returning to his apartment, his neighbour Penny (Keira Knightley) who has just broken up with her boyfriend Owen (Adam Brody) finds solace with Dodge where they share a moment of unspoken peace. It is here where Dodge is thrown another curve ball and through his neighbour Penny, he discovers that his wife was having an affair and to compound the situation, she failed to give Dodge some letters that were sent by the love of his wife. With Dodge literally crashing, he attempts to commit suicide by drinking a bottle of window cleaning product. After his failed suicide attempt, Dodge wakes to discover a letter on his chest saying "sorry" and a dog chained to him. This sparks Dodge and Penny to start a mission, help him find his long-lost love and help her find a pilot to fly her back to England to her family and thus their road trip of self-discovery and love begins. While riots ignite around them, fast food chains have orgies, people hire assassins to kill them before the asteroid strikes and even close friends getting their children drunk, these two individuals begin to form a close bond which is the premise behind the movie as they both learn to live again. Seeking a Friend for the End of the World is a well-written and heart-warming movie that has laughs and shocks carefully littered throughout the movie. There's even a great cameo with Martin Sheen as Dodge's father who helps him close a painful chapter of his life. With all the quirkiness happening in the background of the film, the highlight of the film is Carell and Knightley who create these two lovable characters that will really put a tear in your eye at the end of the film. It's definitely a feel good movie! Video and audio quality is above average and there are a handful of special features, including some insightful commentary. I did enjoy the featurette called Music for the End of the World: What's Your Playlist which asked the stars of the film what music they would listen to if the world was really ending. A cute little featurette. In relation to music, the soundtrack of Seeking a Friend for the End of the World is brilliant and really helps with the roller coaster ride of emotions. 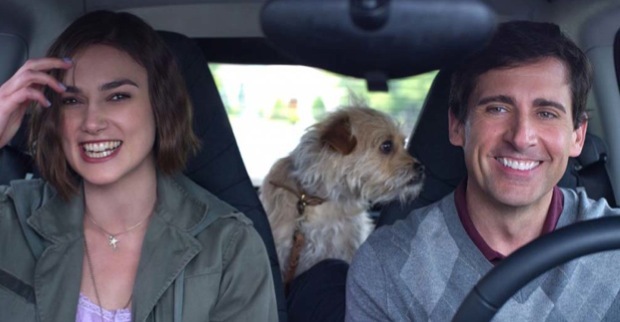 Writer and Director Lorene Scafaria should be commended in creating a rather thought-provoking movie that will have you laugh and cry about a rather serious topic with romance thrown into the mix.